Red lips always make a triumphant return come autumn and the NARS Velvet Matte Lip Pencils do just the trick. Yet again another purchase which has been heavily influenced by Vivianna from VDM, that has made its way into my muji storage and onto my lips and I must say I’m impressed. These matte lip pencils know how to pack a punch, with rich pigmentation paired with a creamy texture. Despite being matte, these pencils glide on rather nicely and dont tug or pull, they last for hours (literally hours!) and leave a nice stain on the lips. In terms of transfer, I wouldn’t worry, drink and eat till your hearts content, you’ll see hardly any transfer. Although they are enriched with vitamin E, they aren’t moisturising, but they’re not drying either, so I like to prep my lips before with a little Elizabeth Arden 8 Hour Cream. I also love the convenience of these jumbo pencils, as it makes it makes it easier and more precise to apply. The one downfall however of lip pencils, is that at some point they will need a sharpen, meaning you will potentially loose some product; my tip would be to freeze them first, then sharpen (good tip huh?!). First up we have Dragon Girl which is a bright bold red, with pink undertones and a blue base. Out of the two I own, this shade is particularly opaque and my teeth look like they have been whitened beyond all belief (know we all know why this lip pencil is Taylor Swifts signature red lip!). Although these pencils have a matte velvet finish, I do find that this shade has a nice sheen once applied on the lips, which is down to the fact it is so bright. 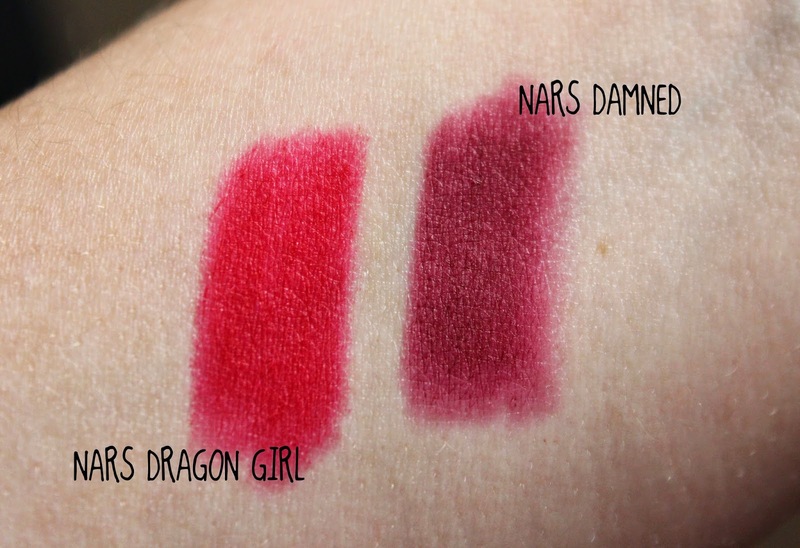 Dragon Girl has been compared to MAC Ruby Woo, but personally I would say that Dragon Girl is far brighter and lighter. Depending on how patient I’m feeling I like to apply MAC cherry lip liner before hand and then clean up around the edges with a touch of concealer and voilà you a red lip ready! Next on my NARS lip pencil list is Damned, which is a purply, plummy colour, with mauve undertones. When applying Damned I feel I need to apply more cautiously than with Dragon Girl, as I find that unless you apply this shade with a light hand, it can appear quite dark and vampy. It also feathers far more than Dragon Girl (as pictured), so I defiantly need to pick up a liner in this shade. Although I would say this shade isn’t as creamy as Dragon Girl, it still doesn’t tug or pull on the lips. I have read that this shade is similar to Rimmel Kate Matte Lipstick 107 and although they are both matte, I would say that 107 is lighter and more of a deep berry shade and Damned is far more purple. Despite the application being a little more tricky, I still love this shade and would say it’s pretty perfect for this autumn! Have you ever tried the NARS Velvet Matte Lip Pencils?